The story of a murder inspired by an ancient Aztec ritual in honor of Quetzalcoatl by a lost codes. A humble street sweeper is the sole witness of a crime committed by art thieves. This movie was released as "Entrega Immediata" . Cantinflas plays a postman who unknowingly gets involved in a spy caper. This is one of funniest turns. Cantinflas was 52 when he made it, but was still in top comedic form. 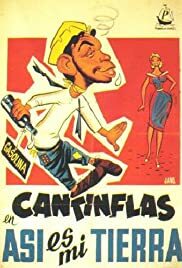 This movie has great early "Cantinfliando", that Cantinflas-speak where he doesn't complete a single sentence, not saying anything at all really, but you understand perfectly what he means. For us Cantinflas fans you get to see the early form of his art just before it is perfected. It's also Golden Age Mexican cinema, with fast moving comical dialogue that keeps your ear cocked to catch every double entendre, and well developed characters based on cultural and historical stereotypes. Here Cantinflas shares the stage with Mexican acting when it was legendary. The macho sparring between Cantinflas and the "Procopio" character is superb comedy as well.